A Police Procedural is concerned with an accurate representation of the day to day realities and procedures of the police and law enforcement. It's a very specific sub-genre of crime fiction. The Police Procedural is almost the antithesis of the Cop Show. 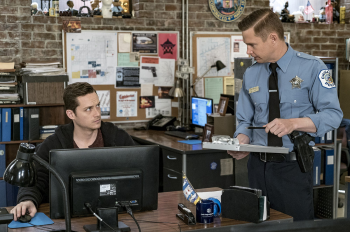 The Police Procedural is characterized by the lack of emphasis on the character's personal lives and the increased focus on the nuts-and-bolts of law enforcement. Note that the focus on "realistic" police work doesn't mean the show has to be set in "reality". A show looking at the day-to-day routine of the Space Police is still a procedural. See also: Criminal Procedural, Forensic Drama, Buddy Cop Show, Cop Show. Patlabor is a Mecha Show Police Procedural, set 20 Minutes into the Future. Ghost in the Shell: Stand Alone Complex is a post-cyberpunk Police Procedural that deals with cybercrime in a world where pretty much everybody is a cyborg. Kurokochi is a Police Procedural focused on the cases of the sleazy cop Keita Kurokochi who investigates cold cases involving powerful politicians. Fell is about a detective in a Darker and Edgier part of town. Gotham Central follows the Major Case Squad of the Gotham City Police Department as they deal with crimes and the villains that plague the city. Judge Dredd is a science-fiction police procedural with heavy doses of satire, Space Western elements and supernatural events. Top 10 is a superhero Police Procedural. Detective Story shows the everyday routine of the 21st Precinct, the issues they have to deal with, from petty complaints by citizens, to minor felonies, to major crimes. Fire in the Sky: Although this film is an alien abduction story, the focus is not on the abduction but on the police investigation. This police procedural takes up about half of the film time. The Guilty has an unusual twist on the genre, being told entirely from the perspective of an emergency dispatcher. High&Low: The second half of Akira Kurosawa's film, based on Ed McBain's 87th Precinct novel, King's Ransom. Hit Team: The only Hong Kong movie that centers on the Hong Kong Police Force's secretive Surveillance Support Unit. M by Fritz Lang's and its sort-of sequel The Last Will of Dr. Mabuse are some of the earliest cinematic examples, starring Otto Wernicke as Kommissar Lohmann of the Berlin police. The Naked City is told from the view point of the staff working at the homicide department, and thus providing us with many of the details of daily detective work. The Next Generation -Patlabor-: The live-action sequel of the Patlabor series, based on the movie timeline. White Heat, despite being known mainly for James Cagney's manic performance ("Made it, Ma! Top of the world! "), with details on how undercover police go about gaining the trust of a villain, and details on how a vehicle tail is conducted. 87th Precinct, Ed McBain's novels. The Beka Cooper trilogy in the Tortall Universe is a police procedural in a setting where policing is a fairly recent concept. Dublin Murder Squad, Tana French's series about Dublin detectives. Maurice Procter's Granchester novels, featuring Detective Inspector Harry Martineau and the Granchester police force. Most of the novels of Michael Slade revolve around Special X, a division of the Mounties who catch serial killers. L.A. Noire plays out like this, with the player actively engaging in police work like collecting evidence and interrogating suspects. Paradigm Shift is a Police Procedural plus werewolves.